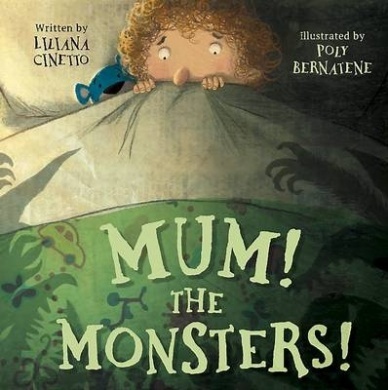 Kids' Book Review: Review: Mum! The Monsters! Mum! The Monsters! is about the experience of needing protection from imagined creatures that lurk inside our rooms when we are little. The emotional journey the protagonist experiences is pretty realistic. The little boy just can't feel comfy in his own bed at night because he knows that all these scary monsters are waiting for him. Naturally, it's up to Mum to come rescue him from his fears. However, Mum gets a little weary because, after all, the creatures aren't real and at some point it's time to face that. The boy is never completely convinced that monsters aren't real. He does, however, manage to achieve a level of comfort when he realises that his Mum is the most formidable opponent of all for these beings. The illustrations are fun and I really enjoy Bernatene's style. That being said, the monsters are potentially scary for your little guy or gal and her rendering of the boy's emotions is impressively convincing. I would have a flip through this one first and make sure your child won't be frightened of the pictures. If you think they can handle it, the takeaway message is absolutely lovely!